I adore artichokes. While in Spain once, I had one of the most memorable meals of my life that consisted of fresh local fish sautéed with baby artichoke hearts. I’ve never forgotten it. Nothing has ever quite matched that meal but my love of artichokes continues. And although I try to eat as few grains as possible, if I had to choose the healthiest most nutritious one, it would be quinoa. I actually make a mean quinoa salad with olives, feta and pomegranate. How very clever of Green People to take these two healthy and delicious foods and put them in hair products……of all things. Everyone reading this website regularly will know by now that I’m a huge fan of Green People. Each new product is met with great excitement here at Ageless, so of course I had to try it. It consists of Quinoa & Artichoke Shampoo, Conditioner & Style Gel. So why Quinoa? Turns out it’s very conditioning and makes your hair wonderfully soft, coating each shaft to make it appear thicker and fuller. It’s also high in protein (which is why it’s one of the best grains) which helps protect and strengthen the hair. And why artichoke? It also protects the hair shaft leaving it wonderfully smooth and shiny and frizz-free. It removes build up on the hair getting rid of dullness and all those wonderful nutritious antioxidants protect against damage from the elements. And oh boy, does it work. From the moment I opened the tube of shampoo and smelled the wonderful fragrant aroma I was happy, but was positively overjoyed with how shiny and bouncy my hair was afterwards. It’s literally not been this shiny in years. After years of highlights, straightening irons, wig wearing etc, I’d sort of given up on having lustrous, shiny hair. So this is actually quite miraculous. The conditioner has the same wonderful fragrance and is the perfect balance of being truly nourishing but not too heavy. The gel which is also a serum styles your hair but also doubles as a leave-in conditioner. My husband has now taken ownership of it and he’s VERY fussy about his gel, I can tell you. And of course, being Green People, the products are organic, natural and even gluten free. They’re wonderfully In-Sync. And by the way, they have lots of other shampoos and conditioners and they’re ALL really good. 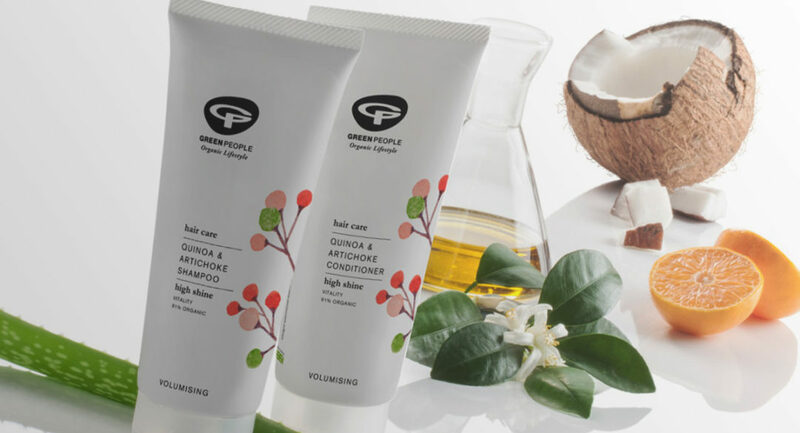 Another favourite of mine is the Irritated Scalp Shampoo as I’m quite prone to flaking but they also have lots of others including an Aloe Shampoo and a Moisturising Shampoo. There’s even a range for sensitive skin that’s scent free and is just as good as all the other products. Check out the Green People website for more details. I’m loving the Q&A shampoo and conditioner. From applying, my hair felt sleek as it did when I had finished washing. It was very soft once dried and I really noticed the tones of colour seemed enhanced. Looking forward to using it again! Thank you for another amazing recommendation but then I have loved all the GP products so far! Yes you are quite right, it is in fact a seed but commonly considered a grain. It’s gluten free, high in protein but as a seed it does produce lectins. Glynis I ordered a set of these products after reading your newsletter & agree that they’re great quality; thanks for the recommendation!